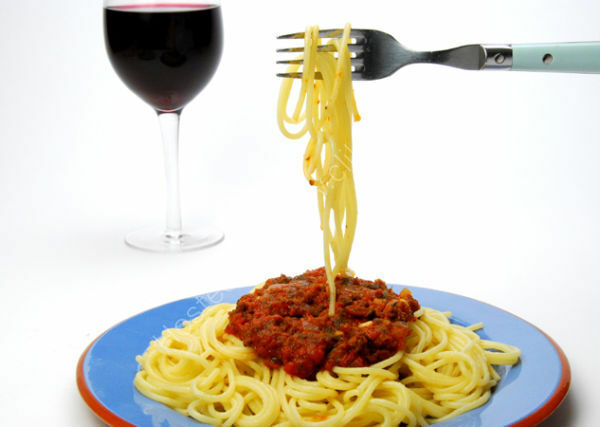 Chef's choice Spaghetti pasta with Bolognese sauce, and a class red of wine. To score with girls guys cook this its easy and will be the best they have ever tasted. Tip; finely chop a red union and three cloves of garlic, heat a nob of butter and two tablespoons of olive oil in a sausepan, let the mixture sweat down for at least five minutes now add a tin of chopped pealed tomatoes, tee spoon of sugar finaly chop herbs corriander and flat leaf parsley and stir in gently. Fry 200kg of fresh mince until brown drain the fat of and stir into the pan add two glasses of red wine and cup of boiled water add a bay leaf for extra flavour and season,simmer with lid on at a low heat for one hour, at a higher heat cook for a further hour,mash down the mixture with potato masher to give a paste look. Serve on pasta covered with loads of parmesan cheese.